This PA package features the Harbinger L502 5-channel mixer, along with your choice of two speaker configurations within the Harbinger line, offering either 12 in. or 15 in. woofers. It also comes with the TRS cables you need to connect them. 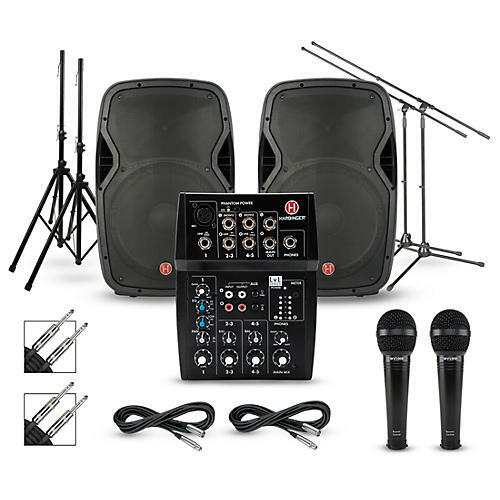 It additionally includes a pair of tripod speaker stands, a pair of tripod microphone stands, a pair of low-impedance dynamic microphones and the mic cables you need to connect them to the mixer. It is a complete, all-in-one PA package that features quality, professional-level components and respected brands for the featured items.